The indicator displays price distribution on a horizontal histogram. 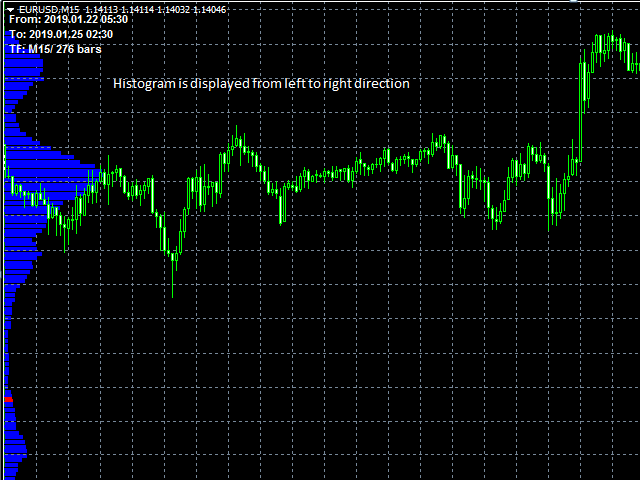 You can improve exist trading strategy or get new trading idea with the histogram of price. Support multiple time frame: you can choose to work with history data in any time frame you want. It does not depend on current display time frame. Support weighting by volume and/or time: the distribution histogram of price can be calculated with volume weighted and/or time (newer prices have higher weight than old price). Full control on history data selection: we provide a set of parameters so that trader can choose history data in the most flexibility way. Flexible on histogram displaying: support multiple histogram on a chart windows, can resize and change position/direction/color ... for histogram. Step 1: select period of data history to calculate histogram(can use default value). Step 2: select the way to display histogram (can use default value). Step 3: enjoy the price distribution histogram. I am sure that you would get many new trading ideas by price histogram and it is also used to improve your exist trading strategy. Part 1: to specify history data(data frame, start point, end point, data length). DATA TIME FRAME: data frame of history data on which distribution price is calculated. LAST_POINT_OF_DATA_OPTION: how do we specify the last point of history data? we have 5 options to specify it. UP_TO_NEWEST_BAR: the last point history data is before the last candle stick (position 0). UP_TO_LAST_VISIBLE_BAR: the last point of history data is the right most candlestick on the current chart and converted to selected time frame. UP_TO_FIRST_VISIBLE_BAR: the last point of history data is the first visible bar on the current chart and converted to selected time frame. HISTORY_DATA_LENGTH_OPTION: this is the option to specify length of history data. It means how to calculate the start point of history data base on last point of history data. There are 4 options for this parameter. FROM_FIRST_VISIBLE_BAR: the start point of history data is the first visible bar on the current chart and converted to selected time frame. Part 2: to specify option for data weighting. 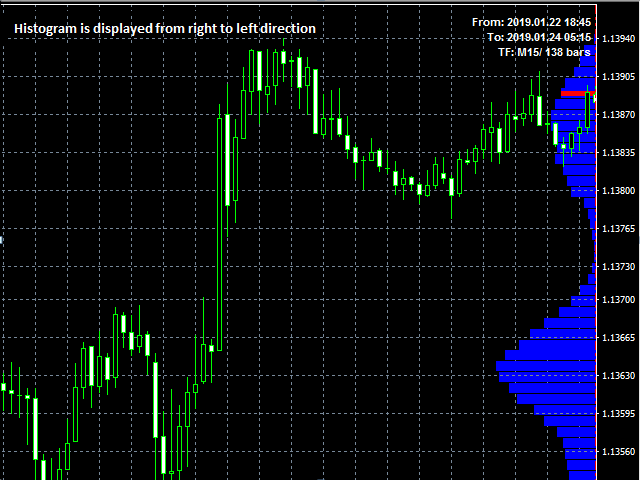 USE_VOLUME_WEIGHT: to turn on/off weight of volume data on distribution price histogram. USE_TIME_WEIGHT: to turn on/off weight of time on distribution price histogram. Price of new bar has more weight than price of old bar. Part 3: to specify display option of histogram. HISTOGRAM_WIDTH: the width in pixel of histogram. Default is 100 pixels. GRID_SIZE_IN_POINT: size of grid in histogram. the value is in point of price. HIGHLIGHT_LAST_HIS_PRICE: to turn on/off highlight part in histogram. If this option is turned on. Histogram will highlight the area it is near value of last history price. HIGHLIGHT_COLOR: color of highlight part in histogram. HIGHLIGHT_WIDTH: height in pixel of highlight part in histogram. Part 4: to turn on/off marking history data area. Part 5: to turn on/off displaying comment for histogram.